I've gotten away from the mystery/thriller genre and I really miss it. I think it is time for me to revisit real soon. Like now. I've read reviews stating that this one is a must read for those who like strong female characters. On that basis alone I was ready to pick it up, but now that you've given it such high praise I will be moving it up the queue. I've never heard of this author either, I'm going to have to give this a try - sounds good! Thanks for the heads up. You're right about there being so many mystery authors out there - I love this genre and yet, I have never heard of Alafair Burke. Thanks for the review, Michelle! 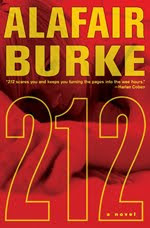 Alafair Burke's books remind me a little of P.D James' and Elizabeth George's mysteries. I love that you got to meet her and tell her about your reading challenge - what fun! Thanks for being a part of the tour. I'm so glad the book was a hit with you.